Due to the widespread internet outage on October 15th, your Le Dîner en Blanc - Dallas Host Team has added additional tables to open participation opportunities for members who originally received a Phase 3 Waiting List invitation. Phase 3 invite codes were released this morning. The registration phase will begin tomorrow - Friday, November 2, 2018, at 12 Noon CST. Please note, that an invitation is not a guarantee of participation. Tables are reserved on a first come, first served basis with your confirmed registration and payment. Bonne Chance! We hope to see you on November 9, 2018! Seven days and counting!!! Dîner en Blanc International is sponsoring a nationwide sweepstake. 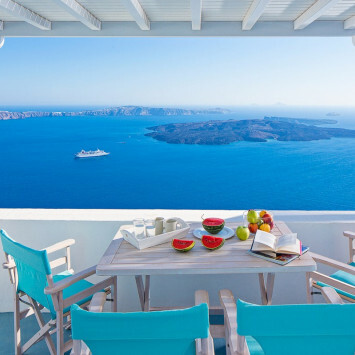 As the prize provider, Luxury Retreats is offering one lucky winner a villa stay worth $10,000!*. Enter here. Dîner en Blanc International is thrilled to announce ONEHOPE as its Official Sparkling Partner. 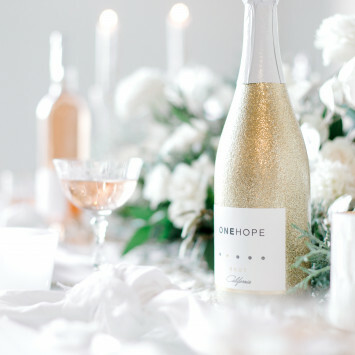 This partnership is the perfect marriage of Dîner en Blanc’s appreciation of creativity and sharing and ONEHOPE’s beautiful and tasteful shimmer bottle. Be sure to try their California Sparkling Brut Gold Shimmer Edition which will be available for purchase on the e-store. Dîner en Blanc International is thrilled to announce Sofitel Hotels & Resorts as its Official Luxury Hotel Partner. 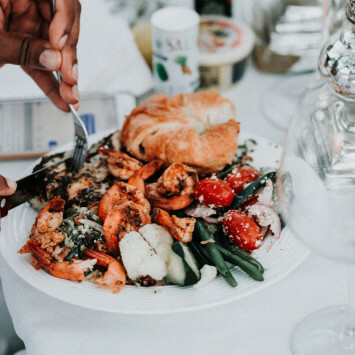 A celebration of the French art de vivre, this partnership is a magnifique blend of Le Dîner en Blanc’s appreciation for refined elegance, design and culinary excellence, and Sofitel’s exquisite hotels, sophisticated service and chic contemporary style. Phase 3: Guests who have signed up to the waiting list. 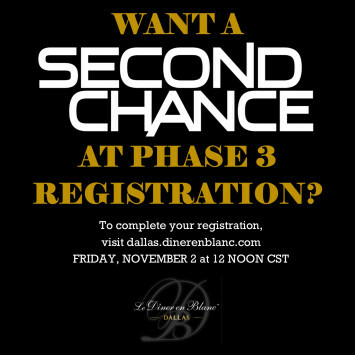 By signing up to the waiting list, you will receive an invitation to register in Phase 3. *Please note that the invitation to register in phase 2 and 3 will be sent out 48 hours prior to the opening of each particular registration phase. The numbers of places are limited, and take place on a "first come, first served" basis. Select "REGISTRATION" to learn the date and hour of your particular registration phase.